How many live rats and under what conditions? 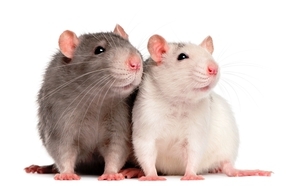 Rats are gaining more and more popularity every year. And this is not surprising because animals are wonderful Pets that are not only very affectionate, friendly and sociable, but have a fairly high intelligence, wit, a wonderful memory. Besides, caring for them is not burdensome and does not require a large amount of time and effort. But despite all its advantages, the rats still have a couple of drawbacks, one of which is the brevity of life. However, it should be noted that in many ways, how many live rats depends on the care and content, and rendered timely medical aid. How many live decorative rats at home? Wild animals that live on the streets, as a rule, do not live longer than a year, due to constant dangers, stalking his these rodents. But how many live rats at home? Rats can live from one and a half to two and a half years. Through a variety of manipulations, the breeders managed to bring decorative rocks that can last up to three years. In very rare cases, a rat may live four years or more. The only mention of the rat-the survivor, whose age was seven years, can be found in the Guinness book of records. Many owners very seriously suffering a loss of a pet, wondering why he died so early, if the care was organized could not be better. But do not forget that the lifespan of rats is affected by not only the content but also genetics. How to choose a healthy pet? The average lifespan of the rats, as previously discussed, a maximum of three, in rare cases four, years. It is important to choose a healthy rat. To do this, or buy it in specialty stores, or good breeders. It is recommended to bring home Pets that are older than six months, and before you purchase to make a careful examination of the animal, subject to different damage. There are many breeds of fancy rats, which differ from each other not only in appearance and lifespan. 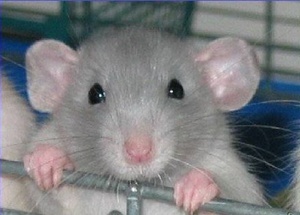 The most common and popular rats have become standards, because they can be bought at almost every pet store. Although they do not have unusual appearance, but are very smart and cunning. Living standards are not more than three and a half years. Rats varieties of the Sphinx is especially popular among people who are allergic to the hair of animals. Sphynx are totally hairless, that does not make them less attractive, but on the contrary, attracts them, because the skin of these animals is very soft, gentle and warm. They just wanted to hold and never release. Rats breed Dumbo different from others its size. Withdrawn was in California in 1991, and received its name for the large ears, which make them similar to the elephant named Dumbo, the hero of the popular cartoon. About what makes a tailless breed from their counterparts is possible to understand the title. The lack of a tail in these animals is the result of mutation. 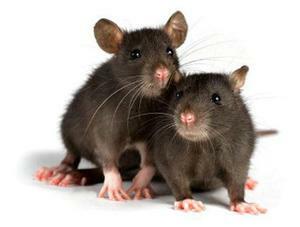 They are derived, contrary to popular belief, was not by any scientist-breeder, but a lover of rats in the UK in 1983. 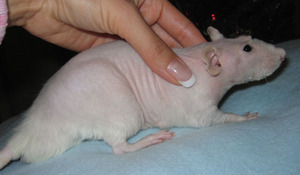 Very thick and incredibly pleasant to the touch fur has rat breed satin. They are similar to the standards, however, the hair on the body more slim and long.They are very beautiful due to the strong Shine of the coat. Double Rexes have unlike the rest of the scalp, which is their double. Using especially fine wool, you can easily see the translucent skin. Sometimes their hair is curled into a spiral. Owners of this breed need to take into account that double Rexes have a tendency to molt. Especially a weakened immune system possess a white rat. However, they are good that very quickly become attached to the host. 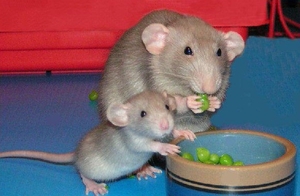 With very good care, rats can live about two years, but usually life is more than a year. To improve the chance for longevity in rats, it is necessary to provide favorable conditions for life, including good nutrition, proper and timely medical care. Food rats not less than eighty percent must consist of whole grains. The remaining twenty percent must combine fresh vegetables and fruits like carrots, cucumbers, bananas and apples, and a variety of herbs, e.g. parsley, dill. You should closely monitor the adequate amount of water in the cage of the animal. Should be placed in a special mineral fertilizer for rodents, which does not contain salt. In the growth period of rats needed to feed boiled meat, which will not very fat, and is also helpful to give them boiled eggs. Rats allowed to eat nuts in small quantities. Knowledgeable in the breeding and maintenance of rats people claim that sprouted grains have a positive effect on the health of these animals. Construction of a comfortable home for your pet is important. Ideally, the cage should be mesh, spacious and with two or more floors. These animals are fond of active pastime, and a variety of games, so you should have a variety of ladders, wheels, hammocks and other accessories, then to put them in a cage. But don’t make them the whole territory, because a large part of the space should be freedom. And yet some part have to take under the house for the animal. The existence of such a refuge is very important to your pet in case of fatigue could get into their safe shelter at any time and be there to relax. Positioning the cage is so that it was purged from all parties and was not subject to drafts. otherwise, animals can get sick. In the case if you purchase one pet, keep in mind that you will have to devote enough time to the rat did not feel lonely and bored. However, if you know that you have a lot of time not at home, and coming to my apartment you have a lot of cases, it would be wiser to purchase a few animals, preferably two females. So your Pets will not get bored and will always meet you from work in high spirits. Give your pet enough attention and give more heat, because his emotional health is directly connected with physical well-being. If you install a cage in a small bath, your pet will definitely be happy and you are happy to be able to watch him. If the bath in the cage there, keep in mind that the rat is not only possible but also need to bathe. For the females this procedure is performed about once a month. With males a little more complicated: they should not only be bathed with the same frequency as females, but wipe with wet wipes in between water treatments. It’s not that difficult, if you follow certain rules, and you and your pet this will be fun. In that case, if the pet you are bathing for the first time, it does not hurt to take extra person for backup in case of the frightened animal. Very , these animals may be susceptible to drafts and can catch cold even with the slightest gust of wind. Therefore, organize the space so that all doors and Windows were closed. Water should not be too hot. It is importantthat the amount of liquid in the tank for bathing, it was not too large although rats are excellent swimmers. The animal will be less frightened if I could stand in the bath. Wash your pet you need special tools. Shampoo for rodents are sold in almost every major store. They will not cause allergic reactions in the animal and will make his coat nicer to touch and more shiny. The advantage of these shampoos is the fact that its hourly’t need a lot of time. Rotolog is a veterinarian engaged in the treatment rats. They are able to provide qualified assistance in case of need for surgical intervention to save the animal. Before you start, a rat, a great solution would be to find a doctor who could give tips and advice to animal welfare and to help if necessary. If you notice any signs that your pet is in pain, immediately consult with a specialist and put a sick rat from the rest. Salmonella is a very dangerous disease. Enters the body of an animal deadly bacteria through food and water. A great danger lies in wait for animals in the summer, because in the heat of the Salmonella multiply faster. Symptoms are constantly jumping temperature and bloating. Unfortunately, diseased rats should be destroyed, and after thoroughly wash hands and handle the cage, because this disease threatens human health. One hundred percent of the cases suffering from infectious diseases, such as that described above for the rat outbreaks were sacrificed either owners, or die alone, and her body is being burned. It is necessary to take precautions that will help you to avoid infection. How many years of living rats Pets depends on their owners. So if you want your pet to live a long and happy life, do not spare their time and effort to care for them!